The much anticipated annual BEST IN PENSACOLA ballot has arrived. It is time to make your voices heard and cast your votes for your favorites in our extensive list of categories. VIP Pensacola Magazine is proud to be the vehicle to bring you the 2019 BEST IN PENSACOLA. It is a TWO PHASE BALLOT with the first round as nominations on April 1-20, and the top ten most nominated businesses will move on to the voting phase on May 13-31. 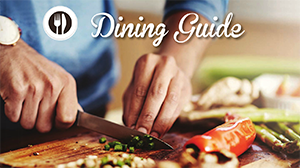 The Pensacola area is overflowing with options to fulfill anyone’s desires for Services, Cocktails & Cuisine, Health & Wellness, and Wedding/Bridal Services. Only you know which ones are the Best so please give your favorite businesses the recognition they deserve. All voting is done via the online ballot. No mail-ins will be accepted. The top ten nominees in each category will move on to the voting ballot. 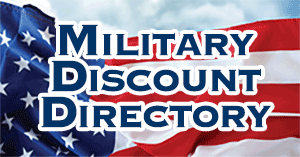 Any nominee must be in good standing with VIP Pensacola Magazine to be promoted as the winner. VIP Pensacola Magazine reviews and revises categories each year based on input from our readers. 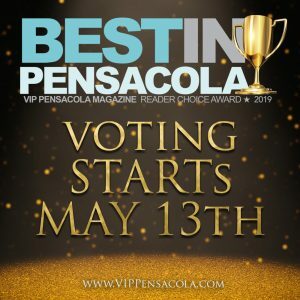 Winners receive the honor of being named BEST IN PENSACOLA and are listed in VIP Pensacola Magazine as the reader’s choice for their respective categories in the July 2019 issue. Winners are provided use of the BEST IN PENSACOLA logo for one year. Owners of winning businesses will receive invitations and will be celebrated at VIP Pensacola Magazine’s annual Black Tie Ball in September, 2019. The mechanics of BEST IN PENSACOLA online voting is driven through UPICKEM, which is copyrighted. Copying or unauthorized use of any copyrighted materials, trademarks or any other intellectual property without express consent of owner is strictly prohibited. Click here to NOMINATE AND VOTE!